The shortest of the Dupin tales, The Purloined Letter is perhaps the most ingenious. The Prefect of the Parisian police pays a visit to Monsieur C. Auguste Dupin about a delicate matter. An incriminating letter has been brazenly stolen by an important Minister. “His lynx eye immediately perceives the paper, recognises the handwriting of the address, observes the confusion of the personage addressed, and fathoms her secret.” The Minister D. steals the letter substituting one of his own, but his theft is observed. The lady cannot stop the Minister because of “the other exalted personage from whom especially it was her wish to conceal” the letter is also present. The police, of course, have delicately undertaken measures to search the apartments of the Minister to retrieve the letter. They searched every corner, every niche, every square inch for the hidden letter. They even waylaid the minister twice, “as if by footpads,” but despite every measure, they failed to discover the purloined letter. So the Prefect appeals to Dupin, who suggests the police re-search the premises. Dupin then recounts how he found the purloined document. In the intervening month since the Prefect first visit, Dupin himself twice visited the Minister. First to discover the letter, then to retrieve it and replace it with a facsimile. These French words are roughly translated “a fatal design, if not worthy of Atreus, is worthy of Thyestes.” The last line of the story states these words come from Crébillon’s Atrée. French poet and tragedian Prosper Jolyot de Crébillon (1674 – 1762) wrote Atrée et Thyeste, a tragedy in five acts, in 1707. Briefly, in Greek Mythology, twin brothers Atreus and Thyestes fought over the throne of Mycenae. Atreus was clever, but Thyestes was considered more so. Though Atreus held the throne, Thyestes brought about his death and was in turn deposed by Atreus’ sons. The battle between brothers began the series of tragedies that plagued the House of Atreus and Mycenae until Orestes, Atreus’ grandson, sought redemption. 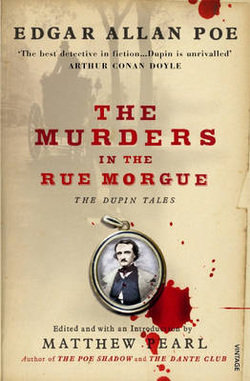 The line Dupin leaves for Minister D. is suggestive that the two are “brothers” in intellect, but rivals akin to Sherlock Holmes and Professor Moriarty. “The brilliance of this piece is Poe’s calling attention to man’s inclination to overlook the obvious.” (Waugh, p. 14) Subsequently this has become a trope in mystery stories from Sherlock Holmes onward. It’s not always used, but it’s a clever means to hide or reveal a clue. Truly which is the greater feat? Deducing where a person has been from physical clues or knowing the discourse of a person’s thoughts from abstract ones? In a relatively short period of time, from roughly 1827 to 1849, Poe wrote numerous stories and poems, spanning the horror, adventure, and science fiction genres. He’s credited with creating the detective genre, but it would be left to others to refine it. Waugh also cites the stories, “The Gold Bug” and “Thou Art the Man”, which also fall into the detective story genre. The first deals with ciphers and codes while the second involves the clever planting of an easily overlooked clue. It is a shame there are only three Dupin tales. Though they may be imperfect, these stories laid the foundation and many of the conventions of the mystery genre to follow. One wonders what Poe might have achieved had he not died so mysteriously in 1849 at only 40 years of age. All of his stories (and poems) have and continue to influence countless writers and readers. Share your thoughts of Poe and his stories.